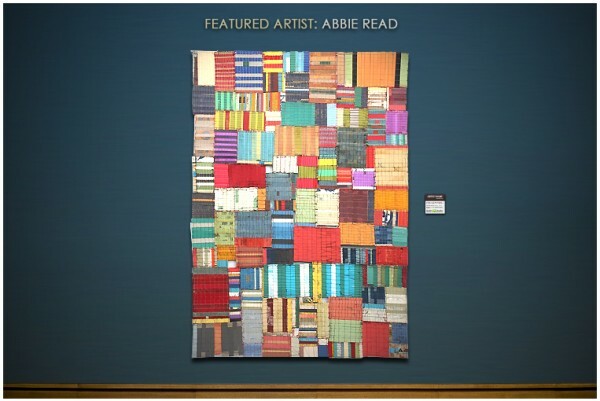 Maine Art Scene Magazine selects Abbie Read as one of 5 featured artists for 2013! I am thrilled to announce that Maine Art Scene Magazine (view magazine) selected artists for its fourth annual online artist exhibit and I’m one of the 5 featured! 84 artists submitted a combined total of 375 pieces of art. Founders Brenda and Thierry Bonneville as well as curator Daphne Anderson Deeds (view web), Maine Artist Ben Potter and Maine art collector Sam Mitchell selected the artists. The virtual exhibit will be made live in May. Stay Tuned! Leaving It Behind is one of the several pieces the virtual exhibit will showcase. It is 78″ tall and 56″ wide, just shy of 7′ X 5′. It’s constructed of strips of book covers sewn together with linen thread. I’ve been working on it obsessively in order to submit it along with two other pieces to the 2013 Portland Biennial as well.